Instagram is a tremendously powerful marketing tool, there’s no doubt about it. I’ve been able to witness it myself, and in case you don’t trust me, there’s always the statistics I can rely on! 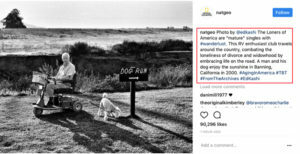 Businesses tend to go where the attention of their audience is, and at the moment, there are not many places where there’s as much attention as on Instagram. In fact, six in ten online adults have Instagram accounts, and 32% of teenagers consider Instagram to be the most important social network. Long story short, if you aren’t on Instagram, you’re missing out on a tremendously valuable opportunity to reach and engage with your audience. Businesses are hopping onto Instagram in a pace never seen before, and unless you want to be surpassed by your competitors, joining the platform and setting up a strategy is a must. 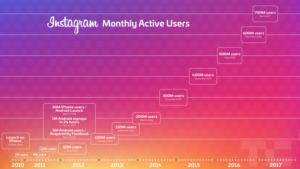 In fact, There are 8 million registered businesses using Instagram business profiles. But that’s not all. 50% of Instagram users follow at least one business. 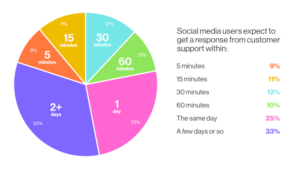 60% of users say that they have learned about a product or service on the platform. Okay, we know that Instagram is powerful. but how can you take advantage of all the advantages it offers? You can’t just post a picture and wait for people to come to you. Unfortunately, it doesn’t work like that. Knowing what not to do is just as important as knowing what to do. If you do everything right, but then make a small mistake, it can hurt everything you’ve built up. Or even worse – cause a media storm. In this article, we’ll take a look at 5 things I learned not to do after 3 years of using Instagram as a marketing tool, and how you can avoid them. Buying fake followers may be extremely tempting when starting up your Instagram page. Just a few thousand followers to boost your popularity can’t possibly hurt, right? Being an active user of Instagram for 5 years, and using it as a marketing tool for over 3, you learn quite a bit about the platform. And let me tell you, I’ve come across quite a few Instagram accounts with fake followers over the years. In fact, I come across at least one every single day on average. Because it’s so incredibly easy to spot. 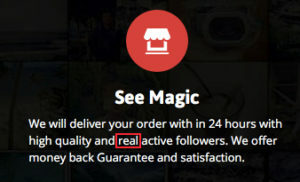 For the untrained eye, spotting someone with fake followers is an impossible task but to those who know Instagram, how it works, and how you use it, 10-30 seconds is all they need to see if your account is organically built or faked. To learn everything about fake followers, I recommend you read How to spot someone with fake followers on Instagram because I can’t possibly cover everything there is to it in this article. In this article, I’ll go more into detail on why you shouldn’t buy them. Buying followers is tempting. I’ve seen people who have turned to me for advice regarding this matter and been able to resist buying them. And I’ve seen people who want fast results, and fallen for the temptation. Buying Instagram followers is cheaper than ever, where roughly $500 gets you 50,000 followers! There are plenty of reasons to why you shouldn’t buy followers on Instagram, and only a few reasons to why you should buy them. Simple. The hard work that is demanded in order to obtain the follower count which they can get within 24 hours is frightening. Also, humans are known to always take the easy way. Many of the services that provide fake followers claim that they are selling real and genuine followers, but that’s not true. Sure, some of them have a service where the users that use it has to start following other users as payment, but what will they do 5 minutes later? Unfollow them of course! Now to the real issue and why I’ve learned that buying fake followers isn’t a recipe for success. When buying fake followers on Instagram, you are in violation of the terms and conditions set by Instagram. In short, it’s not allowed, and if Instagram finds out, they’ll either temporarily ban you or delete your account for good. Most people still put effort into their Instagram account even if they buy fake followers, so getting your account deleted when you’ve put so much time into it is, of course, upsetting. As I’ve used Instagram, I’ve had a lot of people reach out to me, and as you do when someone approaches you, you take a look at their account and see what they are all about. Some accounts have given me a good laugh (thanks for that) simply because their accounts are so incredibly fake that you can see it from miles away. Yet still, they’re trying to pretend like they’re innocent. Yep, permanently banned by Instagram. Unless you want to risk getting banned by Instagram, don’t buy fake followers. Your fake followers are not there to stay. First of all, Instagram is actively banning fake accounts (which are the ones created by the service in to start following you), which means you’ll lose plenty of followers on a regular basis. Secondly, because the maximum limit of people a user can follow, they must unfollow accounts in order to be able to continue with their service. This means that your follower count will drop faster than a ship filled with water. For people from the outside, seeing an account that is losing followers isn’t exactly an appealing sight. The signals that it sends is that you are losing popularity. 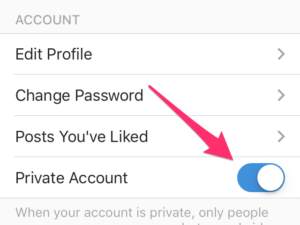 You don’t have to be very experienced to see when an account has bought or buys Instagram followers. During my time on Instagram, I’ve seen accounts of every variant when it comes to fake followers. As a result of having a bunch of fake followers, your engagement will be extremely low. Out of desperation, many people start buying engagements such as like and comments as well, however, that makes it even more obvious. But to be fair, it’s quite entertaining to look at. 10-15, or even 20 comments saying “I love your feed!” “Awesome post” “Amazing photo”. All it does is show that none of your followers really care about what it is you’re posting. Let’s say you have a photo you really want to post, but… the quality isn’t the best, and the photo is quite blurry. Could it pass? Should I post it? I’ve been there too, but I’ve learned that quality is far more important than quantity on Instagram. If you do not have quality images to post at the moment, don’t start posting low-quality content out of desperation. After all, Instagram is a visually driven platform, and the content you share is incredibly important. Preferably, you should share quality and quantity (within reasonable numbers) because that’s when you get the best results. But whatever you do — don’t share low-quality images. It’s 2017! Nobody wants to see a photo that looks like it was taken with a Nokia from 2004. All it will do is hurt you. It’s okay to use other users’ images, in fact, most people appreciate that you use their pictures. If you want to stay on the safe side, it’s always good to ask first, but if you’re asking an account with millions of followers, chances are, they won’t reply. They probably won’t care either. As long as the right credit is given. 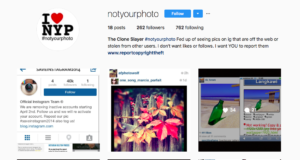 Due to Instagram being a platform where a lot of images are stolen and posted without any given credit, many accounts have been created to call out the non-credit giving image thieves. As a brand, you don’t want to get the bad publicity and bad reputation that comes with getting published on pages like these. The ultimate number of posts you should share on Instagram a day is 1-3, depending on your followers and what they like. This means 1-3 posts spread over the course of 24 hours. Some accounts go crazy and start sharing 5, 7, 10 photos in the course of a few minutes. Just imagine how much this clogs up your followers’ feeds! This means post after post from you. 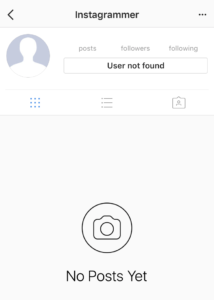 People aren’t accessing Instagram because they only want to see your posts. They want to see posts from different people and get variation. I’ve even followed accounts who have shared more than 20 images every hour. Do you think I still follow those accounts? Thankfully, this has gotten better with Instagram’s new algorithm since it is Instagram who decides what you get to see in your feed, however, if the algorithm considers an account you are following to be relevant, it will display all (or almost all) images in your feed. Just imagine if Instagram finds an account you’re following relevant and then they start sharing tons of posts within a short period of time. As a result of you spam-posting your followers, what do you think will happen? People will unfollow you of course! If you want to share several images at once, you can use Instagram’s multiple-post feature that allows you to share up to 10 posts in a carousel. You are probably sharing too many posts. Not only will having a private Instagram account make you grow your followers slower, it will also decrease your exposure and engagement significantly. When you have a private account, the hashtags you use in your posts will not be visible to people other than our existing followers, thus limiting your exposure to non-followers dramatically. Considering the fact that hashtags are some of the most powerful tools to getting your content seen by people who aren’t yet following you, setting your account to private is a big mistake. As a result, your engagement and growth will take a huge punch. Also, when setting your profile to private, people will not be able to find your posts on location check-ins either, and considering the fact that posts with a location check-in tends to get a lot higher engagement than those without, you’re missing out on two of the most valuable sources for exposure by setting your profile to private. Sharing a post without a caption will make it seem like you don’t care one bit about your Instagram presence. Captions have great power, and by completely ignoring them, you’re missing out on a huge opportunity! Posts with a caption (and a good one) get higher engagement, and it lets you engage with your audience and build relationships with them. In the article How to create appealing Social media captions you’ll learn everything you need to know to craft captions that people will read. No matter how awesome your post is, it needs a caption to help add context. Apart from adding content to the post, the caption is an opportunity for you to impact your audience and get them to do certain actions. With captions, the opportunities are endless, and if you’re missing out on their powers, you won’t be able to reach your full potential. Whether it is comments or private messages you are receiving (probably both*), responding to messages, and doing it quickly is vital for building relationships with your audience. Not responding to message or comments will do.. well… the opposite. If you don’t respond t messages, it will send signals that you don’t care about your audience, and as a result, people will go elsewhere where they actually get some love back. 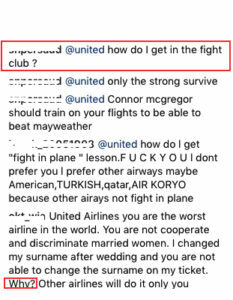 While United Airlines are responding to some messages they receive, they fail to respond to a lot of them. While social media isn’t a major ranking factor, Google has admitted that they take social media indications into consideration when ranking your site, and comments as well as engagement is something they do look at. More engagement means people like your brand and that you are sharing content that people love. Because Google is all about user experience, they reward those who provide a good one. When someone comments on your post – comment back. When someone asks a question – answer. When someone is upset about your bad service – answer. And do it quickly! I’ve found out of my own experience that engaging with people who engage with you, showing that you appreciate them, and value them is extremely valuable. As a result, it increases the retention rate dramatically. All of my most loyal followers who engage with every single post I share and thank me for sharing great content are people who I’ve engaged with through every single message they’ve sent me since two years back! A 2 Year retention rate is not bad! Instagram has many dangers that you should stay away from. If you are committing them, they might be keeping you from generating the results you are hoping for, so evaluate your current Instagram strategy thoroughly in order to spot any mistakes before they do any harm. Learning about the mistakes on Instagram (and social media in general) is just as important as learning what you should do. If you do everything right, but have one mistake that is slowing you down, reaching the goals you’ve anticipated might be a difficult task. Have you committed any of these mistakes? Or maybe, you are doing them right now and need to run as quickly as possible and fix them.